It must be 20 years since I last ate at French restaurant Le Pont de la Tour (now part of D&D London), and the area around has undergone several changes in the intervening years. When it first opened in 1991, in a warehouse complex transformed by Terence Conran, I had a university friend who had bought a flat in the Shad Thames development. I thought it was an odd choice of place to live, even if he did work in the City, and was unlikely to rise in value. As he retired to his country house a few years ago, I see less of him, but I thought of our conversation as I settled down in the new restaurant. Whether because my memory is hazy or because it’s undergone a makeover, I barely recognised the place, and actually entered the restaurant through the attached Le Pont de la Tour wine shop, which looks a great place for private parties with its long table. Le Pont de la Tour closed for a while this summer for a refurbishment by Russell Sage Studios, and it looks wonderful. I had a drink at the bar (water) but the list of rums, whiskies and cocktails was very tempting. You can eat in two areas – the Bar and Grill, and the Restaurant. The new interiors are darker, sleeker and, apparently, inspired by the French cruise liner SS Normandie. This went over my head, so I’ll simply quote “Erté wallpaper and an opulent gold patterned ceiling evoking roaring twenties glamour”. During the summer there’s a large outdoor terrace where the view of Tower Bridge and the north side of the river must be amazing (note that there are large ships moored there some of the time, so you might find yourself with a view of the side of one of those). The main restaurant was about half full for our lunch, and ranged from suits and ties to more relaxed business lunches. There was a fair amount of drinking going on, I was pleased to see. Wines by the glass (175ml) start from about £7.50 and go up to £15 (for a Lalande de Pomerol, Chateau Haut-Goujon for instance). There’s a sommelier available to make interesting suggestions too. It’s not all French – my dining partner enjoyed a glass of “Monsters Monsters Attack” Riesling from Australia’s Clare Valley (Some Young Punks). It’s is a silly name for a wine, but the sommelier was very informative about the blacked out label – it used to feature an illustration by artist Asaf Hanuka but the importer felt it might encourage children to drink so covered it up. There’s an a la carte menu and a du jour set menu. We went for the latter because it was lunchtime and, much as I like eating food, I still have to work. There’s a link to the menu here, although I imagine this will change (if the link doesn’t work, try clicking this). Our dishes arrived promptly and all six (we each had the three-course menu) were delicious. My roasted cod was perfectly cooked and had a lovely taste augmented by the brown butter and capers (I’d have liked more spinach, although could have made a side order for that). 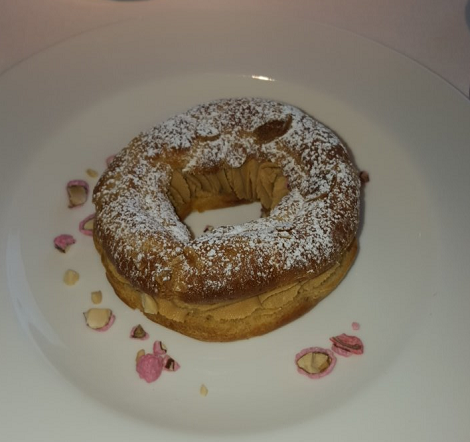 The dessert of Paris Brest and hazelnut cream had me waffling on like one of the judges of the Bake-off about Choux pastry (the name of this dish comes from its resemblance to a bicycle wheel – it’s a cycle race in France between the two cities). Service was excellent – lots of replenishing of bread, water and inquiries if the food was to our liking. The sommelier was informative but deferential, always important when dealing with customers such as ourselves whose knowledge of the subject is just deep enough to reveal their ignorance. There’s a link to the wines here. A really enjoyable lunch. I still think it’s a strange part of London but I don’t work in the City so it seems a long way from the West End. The food, service, views and choice of wines make this something special. A great spot for a weekend brunch as well. OPENING HOURS Lunch Mon-Fri 12pm-2.30pm and Sat-Sun 12pm-3pm; dinner Mon-Sat 6pm-10.30pm, Sun 6pm-9.30pm. PRICES £23.50 for a two-course set menu, £28.50 for a three-course set menu.